I knew the moment I said a resounding yes to keeping the piano the previous owners of our house asked if we wanted, there'd be a sage lesson that came from keeping it. I just didn't know when it would come. My father played the saxophone. Thinking music was in our gene pool my mother insisted my sister and I take piano lessons when all I wanted to do was curl up in my bed and fill my black and white notebooks with stories. Instead, for one hour, one day a week, I accompanied my sister pouting and stomping to our piano teacher’s apartment, a kindly woman who wore her hair in a bun hung low at the nape of her neck and schoolgirl shoes.. 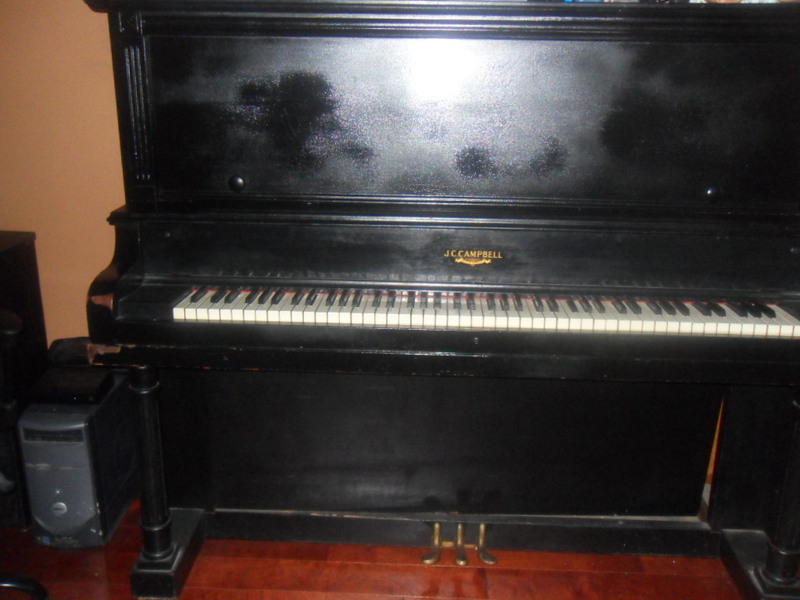 Her piano sat in her living room like an anomalous piece of oversized furniture. To her, I'm sure she saw it as an amazing instrument that would one day produce musical prodigies. She had a tender but firm voice, and when it was my turn for a lesson, I purposely stiffened my fingers no matter how many times she urged me to flex them. It didn't daunt her. “Place your left index finger on F and your right index finger on G. Press 6 times. Move your left hand down a E but keep your right one in the same place G. Press 6 times, …Okay let’s repeat. See dear, you're playing Chopsticks. All I wanted to do was write stories about cats and little girls that lived in Paris. But somehow she taught me how to play chopsticks good enough for a dreaded recital at a neighborhood church. “Both hands held sideways, little fingers down. Now play Jeanine,” she instructed. “You can do it.” And I did even with butterflies in my stomach but I vowed never to go near a piano again. Now, over forty years later, here is this piano in my home otherwise untouched unless my granddaughter is playing a rendition of “Bang, Bang, bang,” and I finally have embraced the lesson it has been trying to teach me. Jeanine DeHoney is a wife, mother, and grandmother of three, whose beloved computer is kitty cornered next to her beloved piano. She has had her writing published in Quality Woman’s Fiction, Mused-Bella Online, Mothering.com, Literary Mama, The Mom Egg, Grand Magazine, on the site This I Believe and Writing-Kids, Funds for Writers and Writing-world.com. She has also been published on the blogs Divine Caroline, The Mom Egg, and Good Enough Mother and was an essayist in "Chicken Soup for the African American Woman’s Soul," and "Living Lessons," and upcoming in an anthology entitled "The Perfect Pair," about women and their love affair with shoes. Currently Jeanine is a contributing writer to EsteemYourself E-magazine. Writing lessons are EVERYWHERE!!! :) This post made me smile and remember some of my old piano lesson days. . .thanks for sharing. So, I'm dying to know....do you continue to play or does the piano just sit there? I believe writers (as well as all other artists) need to mix things up a bit to stay flexible and inspired. So, I was thinking of renting a piano before buying one. I used to play in my twenties, but it's been a long time. So thanks for the inspiration. but I'm really interested in whether you're playing or not. And if so, has it affected your writing? Thanks for this, Jeanine! I, too, took piano lessons, participated in recitals, and was actually pretty good. I played everything from Joplin's The Entertainer to Beethoven's Moonlight Sonata (or parts of it anyway). I finally quit one day when I was old enough to make my own decisions (I think I was around ten or eleven) because I despised practicing every single day! I wanted to be outside playing soccer, playing with my friends, or doing something else that wasn't so repetitious. I didn't have the patience to see it through. But now I wonder how good I would be if I stuck at it? Thanks everyone for the comments. Connie, sorry to say I am not playing anymore butI truly hope that my grandchildren develop a love for playing because it is a beautiful instrument. Every now and then I do dream about being at Carnegie Hall all decked out in a beautiful gown and playing to a standing ovation though. (smile) As far as my writing, yes this piano continues to inspire me and maybe one day I will write a children's book about it. And Angela sometimes we as writers need visualization even if it is our childhood piano teacher. Happy writing.